The games keep coming thick and fast for Banbury United and next up is Yate Town for Saturday’s Evo-Stik Southern League clash. The Puritans won 3-1 at Yate in the previous round of the FA Trophy back in September and now manager Mike Ford will be looking for his side to pick up three more Division One South & West points at Spencer Stadium. But Ford still has plenty of injury concerns leading up to Saturday’s game and will be hoping to have some of those who missed Tuesday’s FA Trophy replay defeat back for the game. Ford didn’t start with Zac Meachran for Tuesday’s game and said the young midfielder needed a break despite some excellent displays of late. 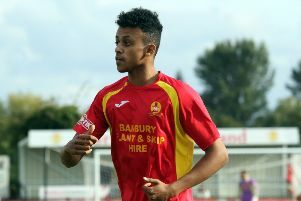 Ford said: “Without Mark Bell, Zac McEachran has been excellent and our most creative player but he needed a rest. Looking ahead to Saturday’s game, Ford added: “Yate’s budget is probably twice as much as ours but we’re managing to bridge that at the moment. United are two places and three points outside the play-off positions and Ford will be hoping to see his side back in them come Saturday at 5.45pm. Yate are a further three points behind and have a played a game more than United who are second only to Winchester City in the total number of goals they have scored.